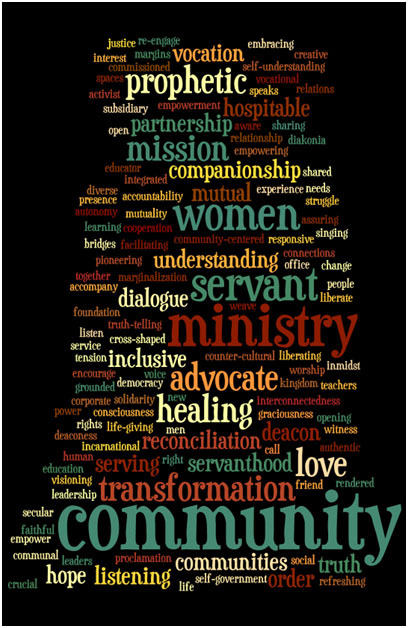 A word cloud of diaconal ministry created by students in the CCS Integrating Year 2010-2011. The Greek word diakonia means service among others, and has it roots in the Christian scriptures. Deacons (or “diaconal ministers” as they’re called in the United Church tradition) carry out all kinds of ministries, often in the areas of education, service, and pastoral care. Those in the diaconate serve in various capacities, such as in congregational ministry, in community development, as chaplains, in inner-city ministry, as overseas personnel, at lay education centres and theological schools, or in staff positions within their presbytery/ conferences/ diocese/ General Synod/ General Council. These ministries can also include responsibility for liturgical and sacramental leadership. Many Christian denominations have diaconal ministers. In the United Church of Canada they are commissioned as a distinct from but equal stream within the order of ministry. In the Anglican Church of Canada the office of “deacon” is sometimes a stepping-stone toward priesthood (transitional diaconate), but there are also those who are ordained to life-long vocational diaconal ministry. One of the traditional symbols of diaconal ministry is the towel and bowl. 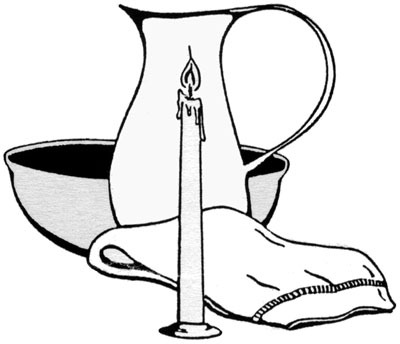 Many appreciate the traditional message of this symbol of humble service, as a reminder of Jesus, who took on and transformed the role of servant by washing the disciples’ feet. Others are raising questions about the symbol’s potential to promote servility and challenging the message of humble service when it is directed toward the marginalized. 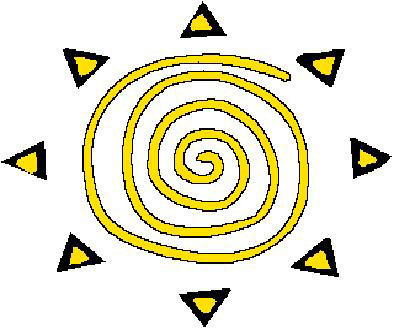 Another symbol that is popular around CCS is the spiral. It represents, among other things, the flow of the Spirit, and the deeping of understanding that comes from moving from experience to reflection to action and so on. God calls us to diaconal ministry. The gospel of Jesus invites all to this ministry: to offer compassion and accompaniment, to work for liberation and justice, to act as advocates of creative transformation. Diaconal ministry, as a recognized order, is rooted within our faith tradition and history, and it is continued and embodied in an ecumenical, world-wide community. in a world of love and respect. nurtures life-giving community, fosters peaceful, right relationship, within the church and the whole of creation wherever the Spirit may lead. How will we know when we have enough deacons? When all people respond to the challenge to live, not in the love of power but in the power of love. for the Episcopal Diocese of Minnesota.